This Requiem Solemn High Mass Set is made church damask fabric with cross designs. 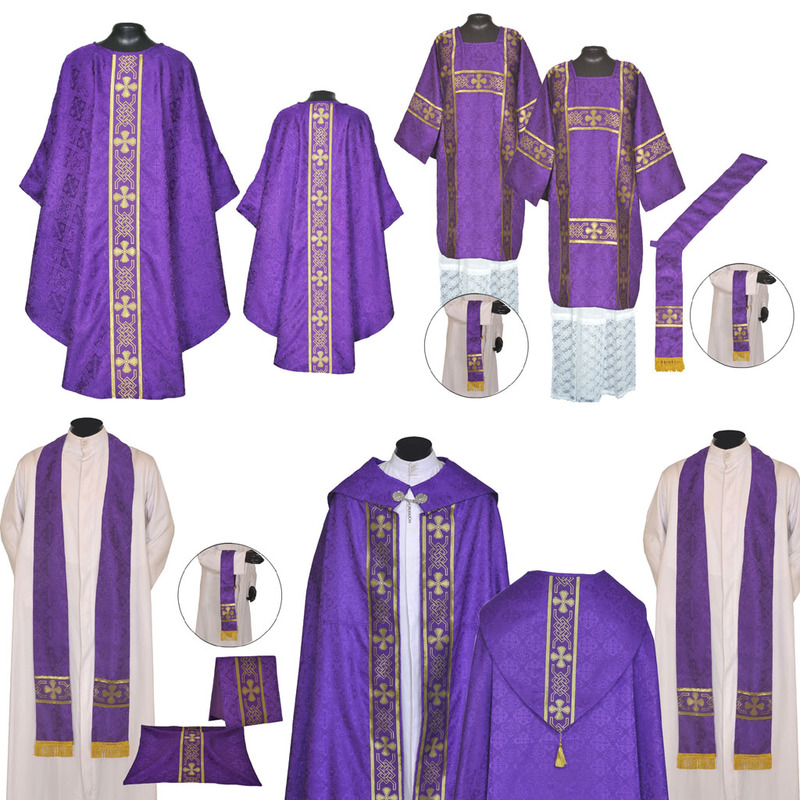 The orphreys are made of fine quality polyester fabric with Gold cross designs. The motif on the back of the chasuble & the cope are hand embroidered with metallic Gold yarn directly on the fabric. The Hood of the Cope is felt Interlined and lined with matching satin fabric. The stoles come with a small embroidered cross on the midpoint and are edged with white rayon fringes. Interlining: Felt is used as interlining in the hood of the cope for softness and comfort. Chasuble Set - Gothic Chasuble, Stole, Maniple, Chalice Veil & Burse. Cope Set - Benediction Cope & Humeral Veil With Stole. 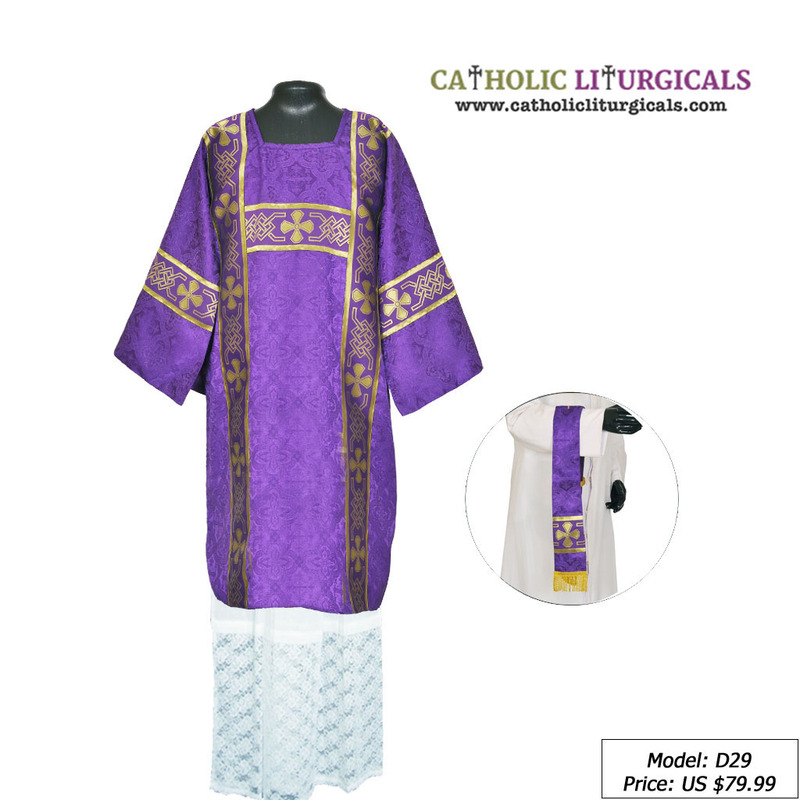 American Dalmatic Set - Dalmatic with Sleeves attached, Deacon Stole & Maniple. American Tunicle Set - Tunicle with Sleeves attached, & Maniple. Custom SIZING: The complete mass set can be custom sized at no extra cost. Please note that this set may be made to order and will take 8-12 days to get shipped if not readily available in stock. After you place the order, Kindly send us an email with order number and custom sizing details.